Young, budding writers learn much from using historical fiction as writing prompts and incorporating many subjects forming a unit study. To demonstrate we will use The Bronze Bow by Elizabeth George Speare who lived form 1908-1994. This book won the 1962 Newbery Medal. Literature and Vocabulary: Students need to learn that historical fiction has a story that arose from the author’s imagination in an historical setting. For The Bronze Bow, we need to know that a small town in Palestine near Capernaum during the life of Christ forms the SETTING for the time and place of the story. CHARACTERS in The Bronze Bow include: Daniel, his sister Leah; Joel and his twin sister Thacia, Joel and Thacia’s father, an important Rabbi; Simon the Zealot (Luke 6:15), Rosh, Samson; Marcus, the young Roman soldier and Jesus. According to the Bible, we know that Jesus lived and the story refers to that Jesus. Simon the Zealot, a disciple, followed Jesus in the Scriptures and in the story. Most of the other names occur often in Scriptures or in general historical writings, but Speare probably just used them because they fit the setting. Other subjects one can address with this book include Math (talk about distances between the village and Capernaum); Occupational Education / History (explore about the occupations of the time – blacksmith, rabbi); Science / Health (explore healing practices of the time), Art / Music (make a model of the area; explore the music of the Jews of that time) and Physical Education (walk 3 miles to see how long it would take to get from the village to Capernaum). Elizabeth George Speare opens The Bronze Bow with our main character on the mountain with Rosh, a zealot. When the Romans killed Daniel’s parents years earlier, he determined to join a band of Zealots under the leadership of Rosh. This young man followed Rosh believing that when the right time arrived, they would defeat the Romans. Throughout the book we see how Daniel progresses in his understanding of how the Jews would be free of the Romans. During the story, we follow Daniel, as a follower of Rosh, the Zealot in the mountain; as a resource for Rosh, in the village and Daniel, as a follower of Christ, in the village. Daniel meets Joel and Thacia while they explore the dangerous mountain area before their family moves to Capernaum. He warns them to stay away from this area. Joel remembers that Daniel had left his blacksmith apprenticeship in disgrace. Daniel firmly believes in Rosh’s mission to restore Israel to self-government without the Romans who had killed Daniel’s parents. Also, Joel promises Rosh that when the time came he would avail himself to Rosh for the mission. After they had gone, Rosh sent Daniel on his first solo job to capture a slave who in the end would only respond to Daniel. Many did not like that Rosh stole and captured to enable them to mount the attack at the Rosh considered the right time. We then learn that Daniel’s grandmother dies and that he must return to the village to care for his sister, Leah. She never leaves her home and cannot tolerate visitors. Daniel can now freely return because the blacksmith with whom he had apprenticed had died. Simon, the Zealot, also a blacksmith, wanted to follow Jesus so he gave his shop and home to Daniel. That allowed Daniel to work and care for Leah. Daniel and Joel both have jobs to do for Rosh while still living in their respective homes. Thacia and the young men meet together and make a pact using the verse from Psalm as their motto, “So that my arms can bend a bow of bronze” even though they did not fully understand it. Surprisingly, Thacia and Leah become friends. Much sacrifice ensues as Daniel continues to believe that under Rosh’s leadership the Israelites will expel the Romans. Daniel, Thacia and Joel find many opportunities to listen to Jesus speak. At first they find it difficult to understand what he teaches. Finally, Daniel, Leah, Joel and Thacia, understand and recognize that the kingdom of which Jesus spoke was spiritual, not physical. Jesus heals Leah physically and all of them spiritually. Rosh did not have the answer, but Jesus did. Elizabeth George Speare does an excellent job of putting the reader into the story and setting. We see how Daniel and others progress from hatred to revenge and finally to reconciliation. Jesus changes lives. On April 1, 1886 Arthur Walkington Pink entered the world in Nottingham, England. During this time, concern existed for the state of the church in England. Men like J.C. Ryle and Charles H. Spurgeon noticed the “downgrade.” Into this climate, A.W. Pink entered the scene. Thomas and Agnes Pink had little idea of the situation and how their son would contribute to it. In a home like that of the Pinks, while business mail could arrive on the Lord’s Day, no one would open it until Monday. Children would read pictorial editions of Pilgrim’s Progress and Foxe’s Book of Martyrs on the Lord’s Day rather than play with the regular toys. We will examine A.W. Pink’s life and work. Though, A.W. Pink grew up in this Christian home, he did not believe. He turned to theosophy, “a cult which, though only formed into a Society in 1875, claimed a special knowledge preserved from generation to generation by a brotherhood of initiates. It’s best known British publication, the magazine, Lucifer, indicated clearly enough its anti-Christian nature …” (p.5) Pink became well known for speaking on behalf of the cult. Thomas Pink made it a habit to wait up for Arthur upon his return from these meetings, reminding him of Scriptures such as, “There is a way that seemeth right unto a man, but the end thereof is the ways of death.” Proverbs 14:12 (KJV) Pink did not like his father’s insistence, but one night this text stayed with him as he tried to work on an upcoming speech. For three days, he did not leave his room, and when he did, God had saved him. Instead of going to an English seminary, he decided to study at Moody Bible Institute in Chicago. After six weeks, he decided that to continue at the Institute delayed his entry into the pastorate unnecessarily. His first pastorate took him to Silverton, Colorado, a mining town. With the Scofield Reference Bible in hand, Pink would find the sum total of Dr. Gray’s instruction. From Colorado, he went to the West Coast, probably in the Los Angeles area. While we do not know how long or much about his time in California, we do know that he then went to rural Kentucky where he met Vera Russell. On November 16, 1916 they married at which time she became his “indispensable ‘help meet.’” Apparently, he visited England a couple of times during those years, but after the Kentucky pastorate, they moved to South Carolina to pastor at Northside Baptist Church from July 1917 to February, 1920. While they had difficulties related to World War I’s effect on the economy, they had even greater difficulties related to Pink’s understanding of Scripture. By 1910, he had more books than his Scofield Reference Bible that influenced his thinking. That would play an important part in his work. At times, the Pinks lived in homes with other families and other times they rented their own accommodations. I admire those in that era who shared living space with other families. This happens in our day as well, making for additional struggles while relieving financial difficulties. A.W. Pink’s work took him from the U.S. to Australia, to the United Kingdom back to the U.S. and finally back to England and Scotland. God had called Arthur to preach, of this he was confident. At times in all three continents, many flocked to hear Pink preach. God used him mightily, but as time passed doors closed to his preaching. What happened? For one thing, in general, the church experienced a “downgrade” as Spurgeon called it or an evolution to liberalism at one extreme to an “easy believism” among evangelicalism on the other. He explored different denominations, but none with which he could agree enough to become a member. Nonmembers did not receive invitations to speak. Guided by his call to preach Pink continued searching for some time. In the end, Pink stopped attending church. What about Hebrews 10:25? “Not forsaking the assembling of ourselves together, as the manner of some is; but exhorting one another: and so much the more, as ye see the day approaching.”(KJV) This controversy affects our thinking regarding Arthur W. Pink. Knowing God’s insistence on the importance of the church throughout the New Testament and this particular command to assemble with other believers I wonder how Pink could not find a church where he could, at least attend. His studies had led him away from the teaching of the Scofield Reference Bible. To the Pinks’ credit, though they did not attend church, they did study and worship in their home. Further, he did search the Scriptures to see what they taught. Even while Pink preached and searched for churches where he could join and speak, he began publishing Studies in the Scriptures, a monthly magazine. Early on they lived with couples who handled much of the typing and publishing of these magazines. Eventually, Vera learned how to type and they handled everything. Somewhere along the line, he recognized that his voice would only be heard through the printed word. At times, many subscribers received the magazine while at other times they did not know whether they could continue. Pink provided a varied diet maintaining different series that ran from month to month. He spent much time in corresponding with readers with a pastor’s heart. Later, these were republished as journals for each year or as books. Among his most famous books: The Sovereignty of God and The Attributes of God. Further, many have read Gleanings from Genesis and Gleanings from Exodus. His first publication, The Divine Inspiration of the Bible, appeared in 1917. Volume One of Studies in the Scriptures appeared in 1922. In December 1953, the final issue of Studies in the Scriptures appeared months after his death. Pink persevered thirty long years in this ministry. Ian Murray, the biographer, provides the reader with a chronology of Pink’s published works. This allows readers to note when each was published understanding how Pink’s thinking matured over the years. A.W.Pink’s influence grows as more and more readers find his works. Arthur and Vera Pink lived in Stornoroway, Scotland for his last seven years. Arthur breathed his last breath on July 15, 1952. He had prepared articles for The Studies in the Scriptures for future issues. Vera wrote to friends, “I can only say, ‘He hath done all things well’… My dear one is now in glory where he so longed to be with Christ.” P. 184 She completed the publishing part concluding at the end of the following year. Though she recovered somewhat from a stroke her ability to type diminished. Pink’s beloved wife ‘went’ home on July 17, 1962 at the age of sixty-nine. Though their lives had ended, their labors live on in A.W. Pink’s writings. My wife and I have both benefited from reading some of the many thought provoking books written by Arthur W. Pink. It is without controversy that we would not be the Christians we are today had we not been so mightily blessed by this beloved brother in Christ. We would greatly encourage others to pursue as many of A.W. Pink’s books as possible. It will be time well-spent. Compare / Contrast life of the main character and your life. Introduction: Introduce three areas using parallel structure to introduce these areas. Conclusion: Review three areas using parallel structure to summarize these areas. Reading Esther’s Burr’s Journal made me think of how different her life seems from mine so I chose the above outline for my essay. Born on February 13, 1732, Esther Edwards grew up in the home of the great theologian and famous preacher of the Great Awakening, Jonathan Edwards. Later, she married Aaron Burr. Their son, Aaron Burr Jr. became Vice President and most notably challenged Alexander Hamilton, the Secretary of the Treasury to a dual. Hamilton died as a result. I knew nothing of Esther Burr before reading her journal. This journal opens on her ninth birthday when she declares that her mother had her stitch pages together to make a journal. Certainly, a girl writing a journal in 1741 lived a life much different than mine. Yet, we share in important ways. Exploring these similarities and differences, we will look at her relationship to her parents, her husband and her Lord. Immediately, Esther’s references to her parents struck me as very different. She referred to them as Mr. or Mrs. Edwards. Except as a very young child when it was Daddy or Mommy, I have referred to my parents as Dad and Mom. While some of my peers have used other names for their parents, I know of none who referred to them as Mr. and Mrs. when talking about or to them. Further, Esther would include additional terms of respect such as “my honored father, Mr. Edwards.” From the journal, I suppose that, when talking to them, Esther called them Father and Mother. My mother also called her parents, Father and Mother. As I grew up, I believe that my parents expected and received more respect from my siblings and me than others. I grew up in a military family and that possibly contributed to a greater expectation than the general population. Even so, overall I believe that respect for elders has greatly diminished throughout my life time and certainly quite a bit since the 1700s. Later in the journal, I found that the path from meeting an individual to marrying has changed much since the life of Esther Burr. Aaron Burr, a preacher, had visited the Edward’s home over an extended period of time and it surprised Esther on the day that she took her turn to prepare a breakfast for Mr. Burr and no one else came to breakfast. Mr. Burr asked her to marry him. Her response, “If it please the Lord.” Later, Mr. Burr sent horses for Esther and her mother. Upon arrival, Aaron and Esther married. Again, she referred to her husband as Mr. Burr. At the age of 20 she became a busy pastor’s wife. Later, they had two children. When he had to preach or teach elsewhere, she missed him and even gave birth to Aaron Burr, Jr. in Mr. Burr’s absence. I, too, desire to show respect for my husband. In our day, women commonly refer to their husbands by their first name unless talking to a child who should address him as “Mr. ….” While, I do not believe we must return to that formality, as Christian wives, we must show respect for our husbands to them as well as about them. In addition, when talking to others, we must not speak ill of our husbands. Certainly, though not perfect, they are perfect for us. God uses spouses to sanctify each other. Reading Esther’s journal provides a great reminder to all of us. Yes, knowing that the holy and sovereign God of the universe is the God of His children grants us blessings untold. I do not have to be the daughter of famous parents nor married to a famous man, to know that I am the child of this great God. Getting to know Esther Burr through reading her journal has enriched me. Accompanying huge contrasts in our lives, I rejoice in the similarities. Her relationships with her parents, her husband and her Lord reflect mine in so many ways. Within six months of each other grandparents and parents of Sally Burr Reeves, age 4 and Aaron Burr Jr., age 2 died leaving them orphans. Aaron Burr died at age 41. Months later, Jonathan Edwards died as a result of a small pox vaccination. Within 16 days Esther Burr died. Six months after Jonathan die, Sarah died of dysentery. These individuals gave their all for Christ. Outlining a biography provides practice of this important pre-writing, comprehension and study skill. Marilyn Alexander wrote of her husband, Jeffrey Alexander’s Fifty Years of Ministry with the purpose of informing his family, friends and others of how God has used this man for fifty years. When teaching students to outline include an introduction to MS Word or other word processor’s outlining feature. For beginners using the chapter titles and other headings provide a great introduction. Later, you should require more detailed information. Also, at some point a student should experience using parallel structure in the outline. Marilyn Alexander provided examples of parallel structure in her headings as the same parts of speech appear in a pattern. Repeating words and phrases work in outlines. 1. Born on October 25, 1943 in Denver, Colorado to Alex and Verdonna Alexander. 2.Called to Salvation – at age 6 in an American Sunday School Union Sunday School held at an elementary school in what is now Lakewood, Colorado. 3.Called to Conviction – His father showed conviction when comparing the teaching of God’s word with what he heard at a denominational church. His father led the family to South Sheridan Baptist Church (SSBC). Under the ministry of Ed Nelson, God called Jeff to preach. 4. Called to “Call-ege” #1 – Ed Nelson encouraged Jeff to attend Bob Jones University in Greenville, South Carolina. God provided the finances for the first semester through his work at a supermarket and a warehouse man for the summer. Further, God supplied for the second semester with a gift from a family that had saved a sum of money and had given it to the Lord. 5.Called to Serve Servicemen – Jeff took every opportunity for ministry during his college days and beyond. On one occasion he went to the Christian Servicemen’s Center in Augusta, Georgia. Here he preached his second sermon and God protected them from a probable fatal collision with a train on their way back to campus. 6. Called to Preach – Jeff received his first license to preach on June 1, 1962 for a three month summer ministry with Gospel Fellowship Mission. Encouraged to study at Baptist Bible College -Summer Ministry did not provide finances for another year at BJU. New leadership added to Jeff’s interest in BBC – New president – Jack Hyles and new vice president – Ed Nelson. This leadership lasted only one year. Called to the Candy Kitchen – Jeff worked at night at Russel Stover Candies and attended classes at Baptist Bible College during the day. He lived at home. Called to Artistry – Jeff began to use his artistic abilities at area churches doing chalk art and preaching. Called to Sugar City – SSBC licensed Jeff for a summer ministry. Chapter Three – Called to Sugar City – 1963 1.Called to a small town in southeastern Colorado – Jeff attended services in Crowley and preached in Sugar City on Sunday afternoons. People came from Crowley and Ordway. Called to trust God for provisions – a place to stay, a refrigerator, food, help with the vehicle. Called to Pillsbury Baptist Bible College (PBBC) in Minnesota – encouraged to go by Ed Nelson and Dr. Monroe Parker (from PBBC) – small school, plenty of opportunities to serve the Lord. Called and Using His Car – Jeff sold old car to pay for college expenses. His dad gave him the family car. Soon God was using that car to get Jeff and others to ministry assignments. Called to More Preaching – Chicago and other cities in Illinois, other area churches. Called to Do More Art Work – In his preaching opportunities as well as for school drama productions. Called to Use Other Talents – parts in plays and humorous monologues. Called to Date His Wife-to-Be –Marilyn and Jeff, merely aware of each other during their junior year, began to date during their senior year. Jeff’s credit count fell short so he had to take summer school and wait a year to graduate. After summer school, Jeff returned to Colorado, their future uncertain. Galeton, Colorado, located 14 miles northeast of Greeley with barely a population of 100. This calling marks the beginning of Jeff’s 50 years of ministry. Pastor Ed Nelson invited Jeff to his office where two deacons from Galeton Baptist Church waited. They wanted him to preach until they had a pastor. After a couple of months, they wanted him to be the pastor even though he intended to go to seminary eventually. Marilyn, teaching music at PBBC, received advice – write to tell him that she looked forward to seeing him at graduation. Jeff arrived in a brand new red mustang – that did it for Marilyn. Marilyn visited Colorado and Jeff’s family in July, 1966. She asked, “Are you asking me? On the way back they planned the wedding. His salary of $50.00 per week would not provide for a wife. He continued preaching on Sundays and Wednesdays, moved back to Denver to live with his grandmother and worked at a shoe store. Called to Small Town – well treated by all, especially by servers at a café until he went with Marilyn. No more special treatment. Called to Marry – June 10, 1967 – Plymouth Baptist Church, Plymouth, Minnesota. Called to a Busy First Month of Marriage – after a short trip home / honeymoon, they had to get back so that Jeff could officiate at a wedding- 8 days after their own. Jeff’s parents celebrated 25 years of marriage 13 days after they Jeff and Marilyn were married. Called to Enjoy Ministry –Music and Fellowship and Punctuality lessons. Called to More Education –Marilyn taught piano and organ lessons at PBBC in Denver. Jeff took a class at BBC during that time. Called to Even More Education – Symptoms of pregnancy in 1968 prompted the Alexanders to move to Minnesota for seminary before children started coming. Jeff sold his mustang and purchased a car that could haul a U Haul. Called to Secular Work – to provide for family – shoe salesman and fabric warehouse driver. Called to Lead Others – Many people associated with Central Seminary and PBBC ministered in the church. Called to Support Missions – Jeff and Marilyn participated in monthly meetings of Twin City Association of the Minnesota Baptist Convention and Jeff held positions. During this time he learned of “Faith Promise” and it ignited a desire to support missions that never died. Called to Good Training – At Central Seminary, Jeff learned of expository preaching and going first to the Word and then later to commentaries. Called to Assist – Jeff wanted more experience learning from a more experienced Pastor. His job included Sunday School promotions and fundraising. Called to Some Productive Fun – Fossil collecting –family fun and future rewards for Sunday School children. Called to Loyalty – Pastoral staff resigned; Jeff was asked to consider to stay, but did not out of loyalty to the godly pastor. Called to Trust God –When salary from Bible Baptist Church ceased, the Alexanders trusted God to provide through offerings. Marilyn wrote in a journal regarding those occasions when God supplied. Called to Live in a “Hallway -”the 32 foot trailer that God provided for the growing family. Called to Help –Helped Jeff’s mom after the death of her second husband and worked in the family construction company for several weeks. Called to Remember the Good and Hard Times – Parking in a Pastor’s driveway between meetings caused some neighbor problems. Called to Close Living – Children were growing up and needed some roots. Called to Spacious Living – Jeff’s brothers were building a house for them in Lakewood, Colorado. Called to Transition – Problems with the truck that hauled the trailer. Called to Lay Ministry – Jeff and Marilyn led the senior citizens’ ministry at SSBC. Jeff became involved in the Colorado Association of Christian Schools. Turning Point – Jeff came to a turning point in his understanding of God’s Word. Turning Point Topic covered in Jeff’s book: Predestined for Heaven? Yes! Chosen to Bless Others with Understanding – First, Marilyn, then daughter Karen and many more. Chosen to Restraint –Teaching Sunday School at his church – though anxious to tell others (as are most new Calvinists), he didn’t want to cause trouble. Chosen Amid General Misunderstanding – Most modern Baptists are unaware of their theological heritage. Chosen to Give Out the Gospel – Since we do not know who God has chosen, we must declare the Gospel to all, trusting God with the rest. Part Three – Faithful –It is God who is faithful. Faithful in Candidating – did not hide position, but that information did not get to all individuals on committee. Why did all the people leave? Faithful to His Philosophy of Ministry. Faithful with Additions to the Family – through foster care. Faithful Despite Decline –moving to smaller building to save expenses. Faithful in Working at a Church Plant – Garden City, Kansas. Faithful to the Garden City Church – had to discontinue, hopeful for future work. When our students write extended paragraphs we want them to use a variety of ways to begin each sentence. Each sentence in the paragraph should start with a different word or phrase. We should see a number of different types of structures at the beginning of each sentence. By using these beginnings writers avoid using too often used words like: and, but, so etc. Since 1986 the Apache remained the best combat helicopter. During the last decade we have grown old. To the train station, I must go. At the store, I looked for green beans. Cruising at * miles per hour, the Apache helicopter performs ideally for a *** mission. Beginning at the beginning makes sense. Jumping up and down warms the body. Reading opens the world to readers. To improve on the Apache would be hard to do. To write a book seems overwhelming to me. To jump in where I do not belong produces trouble. To wear old clothes does not put you in the lower class. To ride in a jet invigorates me. Sleek, speedy and agility, describe well the Stinger missile. Tall and lanky individuals make good basketball players. Short, stubby and broad legs belong to the land turtle. Sweet, sticky and golden brown buns rounded off our breakfast. Stingy and arrogant, the man walked away without a friend. John Bunyan, author of The Pilgrim’s Progress and other books, began his best-selling allegory as if the story to follow was a dream. In real life, Bunyan earned his living as a traveling tinker. His sinful reputation of cursing preceded him as he traveled for his trade. To arrest him in his evil speech, God used a woman who told him that his behavior would spoil the children of the town. Realizing his sin, he determined to read the Bible and ask God to help him live a life pleasing God rather than himself. However, God had not saved him yet, but was using the Bible to work in his heart, specifically John 6:37, “My grace is sufficient for you.” Once God had saved him, he began to learn and then to preach His word. For that he was imprisoned for twelve years, released and later imprisoned another six months. During this second imprisonment he wrote The Pilgrim’s Progress. He also wrote, Grace Abounding to the Chief of Sinners. In the end he continued giving his visitor simple messages from God. At the age of 59 he died. As a young pastor, Jonathan Edwards confronted the youth, under the influence of alcohol, who were carrying on loudly in the streets at night. Eventually, as Edwards continued to preach the Word faithfully, God was pleased to send a revival. While all did not see this as a revival, he continued steadfastly. After a time of cooling, God began using George Whitefield in New England. Edwards invited him to Northhampton, Massachusetts to preach. To God’s glory, the revival rekindled under Whitefield’s and Edward’s preaching. Diligent and changed people met for prayer Bible studies every evening. God used Jonathan Edwards’ famous sermon, “Sinners in the Hand of an Angry God,” in the lives of many people. Later, in 1749, Edwards realized that the practice of the church allowing non-believers to partake of the Lord’s Supper violated Scriptures. Climbing the steps to the pulpit, Pastor Edwards, preached on the new policy. Great and divisive conflict occurred leading to Edwards’ dismissal from the church. Subsequently, God used Edwards as a missionary to the Housatonic Indians at Stockbridge, Massachusetts. Next, the College of New Jersey (Princeton) called him to be the president. Within two months of his arrival at the college, he died of small pox. Calm and peaceful, he died ready to see his Savior, Jesus. We continue to draw on the excellent book by Richard Hannula, Trial and Triumph – Stores From Church History as writing prompts. These mini-biographies work well with learning to write. Paragraph samples for this lesson come from the section on the reformation. In early, 1517 Tetzal, a representative of Pope Leo, arrived in Wittenberg, Germany to tell the people of a way to receive forgiveness of their sin and the sin of their loved ones who were in “purgatory.” By the authority of the Pope, he sold “indulgences” with the simple refrain: “As soon as the coin in the coffer rings, the soul from purgatory springs.” Many believed and bought these “indulgences.” Martin Luther, a young priest, who preached at the great Castle Church, knew better. He preached from God’s Word, “The just shall live by faith,” not by works or “indulgences.” On October 31, 1517, Luther posted 95 arguments (theses) on the Castle Church door to open dialog among the church leaders and people of Wittenberg. Instead, all of Europe entered the discussion. Pope Leo responded with declarations of warnings for Luther. While many followed Luther, others continued to follow the Pope’s teaching. Finally, Charles the Emperor, set up a meeting in Worms (Diet of Worms) where Luther faced church leaders. They gave him the opportunity to renounce his writings. His response: “I cannot renounce these works unless I am shown from the Scripture where I am in error. If I am shown my error from Scripture, I will be the first one to throw my books into the fire.” Further, “Unless I am convicted by Scripture and plain reason – I do not accept the authority of popes and councils alone, for they have contradicted each other – my conscience is captive to the Word of God. I cannot and will not recant anything, Here I stand, I cannot do otherwise, so help me God.” He was condemned as a heretic and sentenced to death. His friends, however, kidnapped him and gave him refuge while he continued to write and translate the Bible into German. He died at the age of 62. *What is the difference between simple, compound and complex sentences? Using biographies to expand writing skills has the added benefit of learning history. 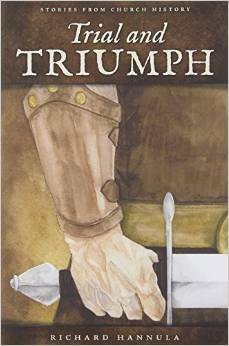 Richard M. Hannula’s Trial and Triumph provides us with valuable mini-biographies of men and women throughout church history. Once the writing student can write five-sentence paragraphs, we can introduce him to the extended paragraph following the same outline as the five-sentence paragraph. This time we add two more sentences to each of the three points expressed in the body sentences. In 1412 Bohemian leaders in Prague began attacking John Huss for heresy. Over time the enemies of John Huss and his preaching make many attempts to stop Huss from preaching in the common language and putting the Word of God in the hands of believers. First, they succeeded in getting him out of Prague where he had preached at Bethlehem Chapel. Members of his church would go to the forests to listen to him preach. On occasion he would sneak into Prague to visit the members of his congregation. Next, the emperor of Germany convinced them to send Huss for a council promising safe passage. Huss agreed and began his three-week journey under protection. He wanted the opportunity to present his case, but many of his congregation doubted the sincerity of the emperor. At the end of the journey, they imprisoned him in conditions that destroyed his health. Finally, he stood before the council with only the opportunity to say “yes” or “no” to the offer to recant. Each time he tried to testify of God’s authority in his life or to pray to God, the council members mocked and yelled drowning out his words. While willing to recant any teaching that was against the Word of God, he would not recant the plain truth of God’s Word. They burned him at the stake, but his life and death influenced Luther and other reformers in the years to come. As you can see reading about the lives of others provide us with positive (and negative) models for our lives. Parents and teachers need to present their children with these models and then to discuss the positives and negatives in these lives. Ultimately, the standard for whether the elements of these lives are positive or negative is the Lord Jesus Christ as presented in His Word. One of my favorite genres of reading is the biography. Not only do I enjoy this read for relaxation, I also believe it to be a great educational tool for our children. Children of all ages enjoy stories and what better story than that of a life lived? History in action. Biographies are history in action. More real life history can be captured by the reader in a biography than in a history textbook. Here you can begin your discussion of the story with Who?, What?, When?, Where? questions and can continue with Why? and How? questions. Listening to your child’s answers help you understand how he is developing in his comprehension and thinking skills. Heroes – Readers need heroes. From heroes we can learn how to live and how not to live. Not all heroes are positive examples, but many are positive in most ways. When reading a biography with your child you can ask them in what ways should he follow this character’s example and in what ways he should not follow the example. Historical Time Line – Making a timeline can help readers to see how the lives of the persons in different biographies relate to one another. # 1: Compare / Contrast life of the main character and your life. #2: Why I do / do not admire the main character? Introduction: Introduce the individual and introduce three reasons. Conclusion: Review three reasons why you admire the individual. #3: Describe the main character’s distinguishing characteristics. #4: Describe the historical atmosphere in the main character’s day. Conclusion: Review three areas and your conclusion. In addition to using these activities with biographies, historical fiction can be studied in this way. With historical fiction, students can explore which parts of the story form part of the historical setting and which parts arise from the author’s imagination. Further students can write their own biographies and historical fiction stories and books.